In 1943, World War II ace Gregory Boyington shot down 25 enemy planes around Papua New Guinea as the commanding officer of Marine Fighter Squadron 214. The rest of the squadron, nicknamed the Black Sheep Squadron, called Boyington "Gramps" or "Pappy" because of his advanced age. He was barely over 30 at the time. The legend of Pappy Boyington's heroic feats continued to echo three decades later, when NBC launched a television series based on his WWII exploits. The network titled it, at least initially, Baa Baa Black Sheep. Robert Conrad, who at the age of 41 was more of a "Pappy" than Pappy had been, portrayed Boyington. Audiences loved Conrad as a rugged, physical actor, a man unafraid of heavy stunt work. He had taken his fair share of bruises and bumps playing James West on The Wild Wild West. While Conrad's lead character was based on a real hero, the rest of the characters were fictional. "They were a collection of misfits and screwballs who became the terrors of the South Pacific," the opening credits declared. The cast included a young John Larroquette and Dirk Blocker, son of Bonanza star Dan "Hoss" Blocker. Though it was inspired by real events in the war, and even hired Boyington as a consultant, Baa Baa Black Sheep struck more of a jocular tone, as if the ETO was a fraternal turkey shoot in the tropics. No wonder. It was the creation of Stephen J. Cannell, the brain behind zippy action hours like The Rockford Files, The A-Team, The Greatest American Hero and 21 Jump Street. NBC slotted Baa Baa Black Sheep on Tuesday evenings at 8PM — up against the top two shows on television, Happy Days and Laverne and Shirley. Consider the TV landscape at the time. It was not entirely different to our current pop culture. Superheroes were soaring (The Bionic Woman, Wonder Woman, The Six Million Dollar Man, The Incredible Hulk, etc.). Pop stars were doing a little song and dance on fluffy variety shows (Donny and Marie, Tony Orlando and Dawn, The Captain and Tennille, The Brady Bunch Hour, etc.). And of course, there were a host of laugh-tracked sitcoms. In other words, Baa Baa Black Sheep was indeed a black sheep, a throwback to the films and television of the 1940s, 1950s and 1960s. No wonder it struggled in the ratings. At the end of the season, NBC pulled the plug. Fortunately for Baa Baa Black Sheep, the following TV season was a historical clunker. NBC launched loads of new shows in the fall of 1978. You probably do not remember titles like The Richard Pryor Show, Mulligan's Stew, Rosetti and Ryan, Quark and Richie Brockelman, Private Eye for a reason. They flopped. Pressed for new content to fill the void of canceled series, the network once again turned to Pappy. 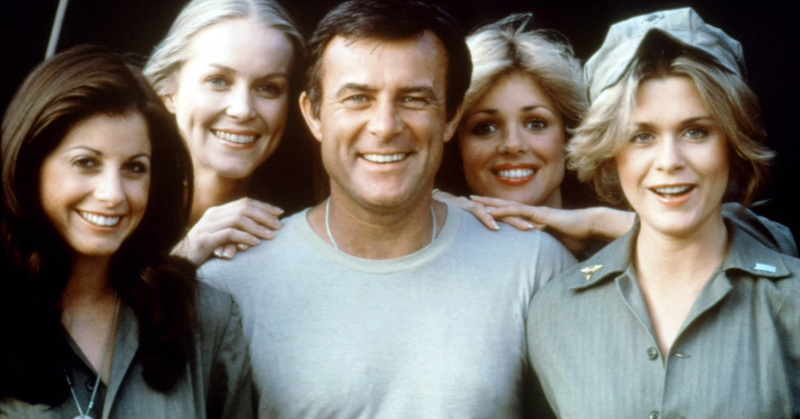 Robert Conrad and company suited up once again, under a new title, Black Sheep Squadron. The show flew to a new night, too, Wednesdays. It was suddenly facing a new, formidable foe — Charlie's Angels. Forty years ago, Charlie's Angels were one of the hottest things on TV, kicking and hair-tossing their way to No. 4 in the Nielsen ratings. Once again, Black Sheep struggled for American eyeballs. But the show did not go down without a fight. Black Sheep Squadron cast its own crew of beauties to play nurses, cheekily dubbing them "Pappy's Lambs," in a not-so-subtle nod to Charlie's Angels. Included in this influx of blondes and brunettes was Nancy Conrad, daughter of Robert Conrad. Brianne Leary (Nurse Susan) was the only other notable addition. She would likewise join the cast of CHiPs late in the game the following season as Officer Sindy, ostensibly to add a ratings boost. Sudden episode titles such as "Forbidden Fruit" and "Fighting Angels" made no bones about the shift in focus for the show. The gender balance added a new dimension to the series, but it was just not to be. It went from being a great show at the wrong time to being a great show at the wrong time-slot. Alas, NBC decommissioned Black Sheep Squadron at the end of the season. But you can't keep a good ace down. Pappy kept popping Zeroes in reruns.